At RadioTech™ we believe that the straps and cases we sell are an important part of the lifesaving equipment that firefighters and emergency workers must use in both day-to-day and extreme situations. Like any piece of emergency equipment, proper care and use can be the difference between optimal function and accidents or injuries. 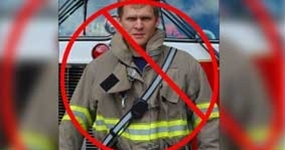 We provide this article to help firefighters and emergency workers understand the best and safest manner to wear and use their RadioTech straps. Our thanks go to Shawn Roark, a Firefighter/Paramedic with the Bristol Virginia Fire Department for his time and effort in preparing this article and providing us with demonstration photos. As a firefighter and EMT, I receive calls for a variety of situations where my RadioTech strap and cases are a standard part of my gear. By wearing my equipment appropriately, I am able to both care for my equipment, the people I’m there to help AND my fellow brothers/sisters who may call in for my aid. After your turnout pants and hood are on, place the RadioTech strap across your shoulder. Then put on your coat and zip or snap it up. Be sure to pull out the radio mic between the top of the zipper and the collar flap. Then buckle your snaps and fasten the collar flap. You can see in the photo that the mic is easily accessible and visible, but does not interfere with the protection provided by the turnout coat or any of the other gear I may need to attach. With the straps appropriately adjusted, you will now be able to access your radio by the mic and at the radio case to make a transmission. The radio body should hang just below your coat to allow easy access to buttons for changing the channel or reaching your emergency/panic button. If your strap is outside your coat it could become 'hung up'. While this is unavoidable with some pieces of emergency equipment, the radio strap works just as well under the turnout coat, so there is no reason to add to your potential for entanglement. When you are at rehab and remove your coat, your radio will be left with your coat. If a brother or sister calls a mayday and command misses it, how can you help? If you wear the strap under your coat, chances are that your strap is still on your shoulder which means that you can respond more quickly to a brother or sister in need. I encourage every firefighter, EMT and emergency worker to try RadioTech straps and cases. Wear them right and they will work for you. They are fantastic pieces of equipment and whether you are driving, pumping, working the fire or aiding the injured, they can help you do your job better, safer and with peace of mind.